The following post has been sponsored by Walmart. St. Patrick’s Day is right around the corner. 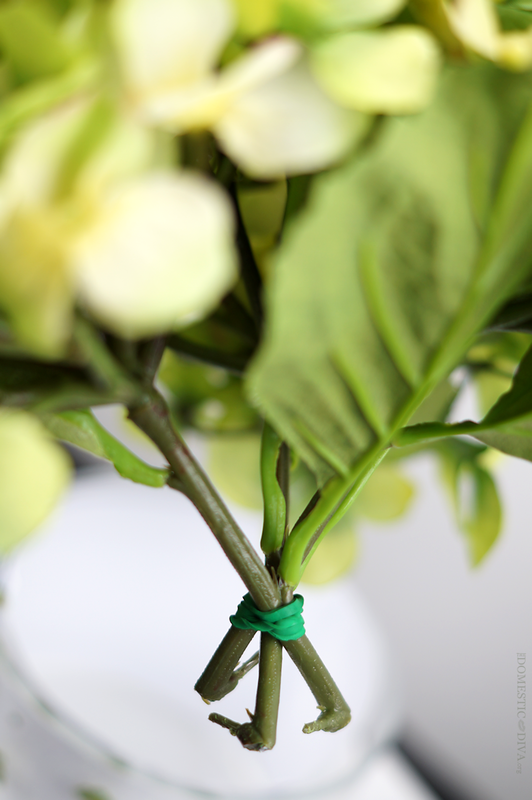 We love incorporating green into our attire and decor to celebrate this festively fun holiday. Today, as a part of the Walmart Moms, I’m going to share with you how easy it is to create a table floral arrangement around this festive holiday using gorgeous bunches of artificial flowers that can be found at Walmart. Of course, St. Patrick’s Day is never complete without some luck from those cute little clovers so we will of course be adding those to our centerpiece as well. I just love the floral department at Walmart. Each season they have new artificial flowers available to match the season or holidays which is why I check there quite often. Walmart’s faux flowers are very affordable and easy to add to a diy floral arrangement for your table or even added to a wreath that one is creating. For this tutorial you’ll need a few supplies, which can easily be found in the craft section of your local Walmart store. First start by placing the glitter scrapbook paper inside the vase with the non-glitter side facing out. 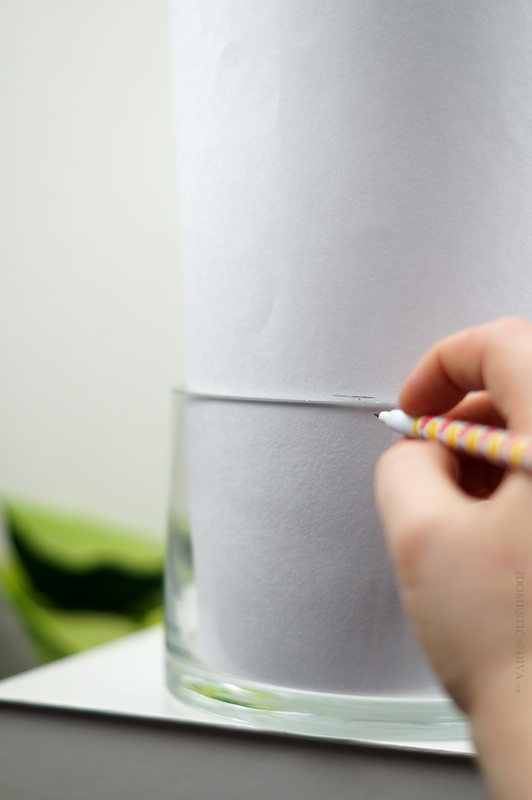 With a pencil, make a small mark where the top of the vase meets the paper. Use this mark as a guide and with a ruler draw a straight line to cut out a 3 1/2 inch strip of paper. You will need two strips of paper to line the inside of your vase. 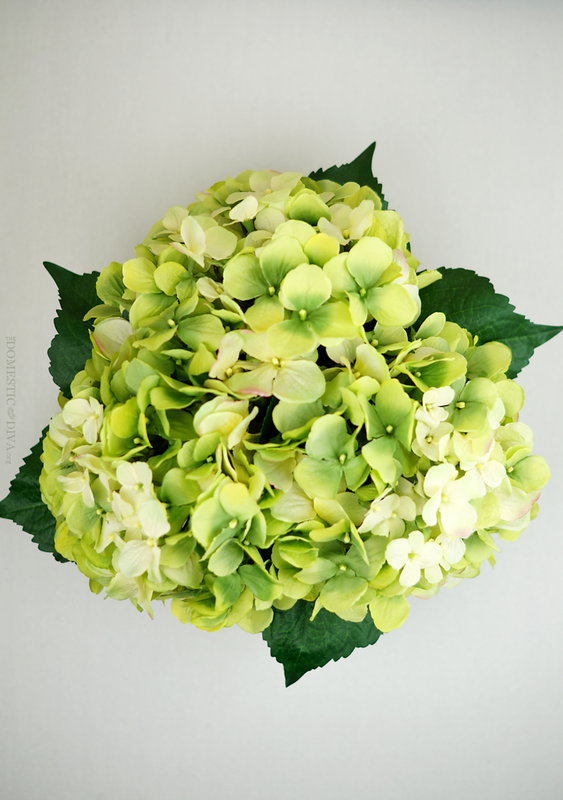 Next, the flowers I chose for this arrangement were 3 bunches of green hydrangeas. These flowers from Walmart have really long stems. Since the vase that I chose to use is short and wide, I opted to cut the stems down really short. One can cut the stems off in one of two ways. 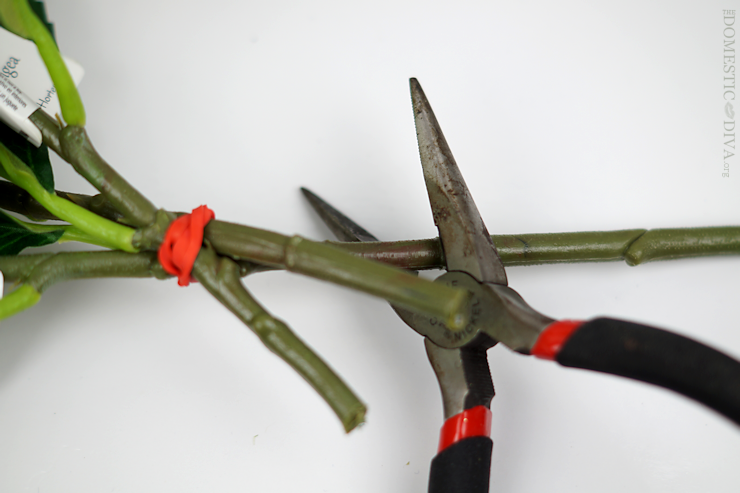 One with a pair of wire cutters or you can use scissors to carefully cut the wire just a tiny bit and then bend the stem back and forth until it finally breaks. Choose the way that works best for you but you want your stems of your flowers to be short enough so that your flowers will sit inside of the vase without falling out. Save any leaves that you may cut off. Next, it’s time for the fun part….painting the lucky clovers all over the vase. I chose a metallic green acrylic paint that I found at my Walmart. I thought the color was simply gorgeous and the shine gives the floral arrangement just a little extra element. 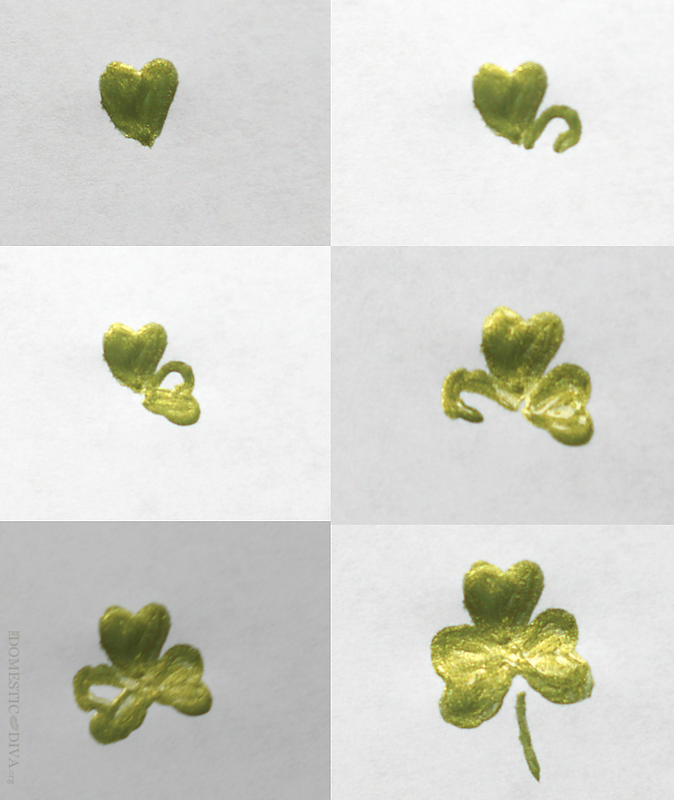 Painting a clover is easier than one might think. A clover is simple 3 hearts together with a stem. I would suggest practicing painting the clovers on a piece of paper first before painting your vase. Since we are painting on glass, if the clover is still wet and you mess up it can sometimes be wiped away easily with a paper towel so you can start over again if you need to. When painting your clovers remember to vary them in size and the direction that they are pointing. I’m really into polka-dots right now so I added dots amongst the clovers to give the pattern some variety. 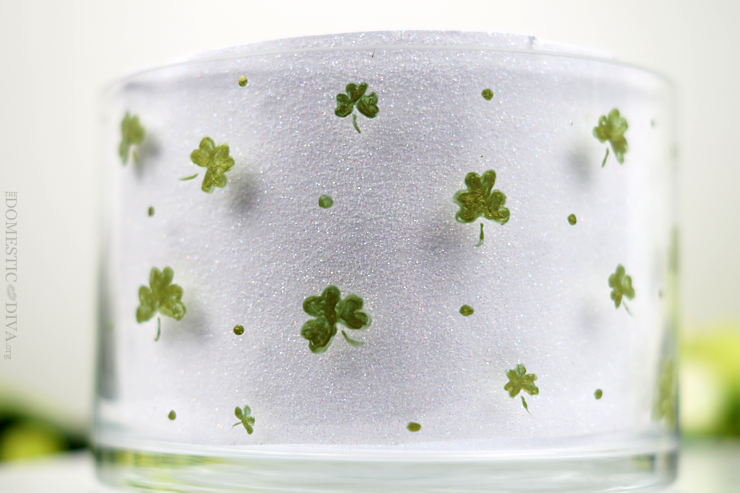 If you like, you can even sneak a 4-leaf clover somewhere on your vase for a bit of luck. I wanted the bunches of flowers that I chose to be really close together in my vase. So to keep them that way I wrapped the ends of them with rubber bands. Any gaps in the arrangement I filled using the leaves that we had left over from cutting off the stems. I think this floral arrangement came out beautifully. This project is fun and relaxing to create during an afternoon and will add just a little pop of green to your home for the holiday. I love the way that this arrangement looks in the center of my kitchen table. From overhead, I think this floral arrangement even resembles the shape of a clover with the 3 bunches of green hydrangeas. What do you think? Lovely, Great Idea, I want one.